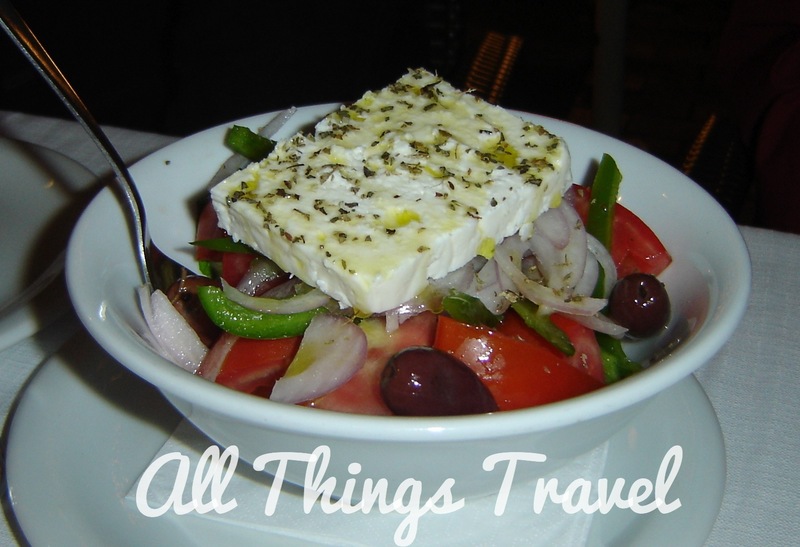 When I think of Greek food, the first thing that comes to mind is olives. 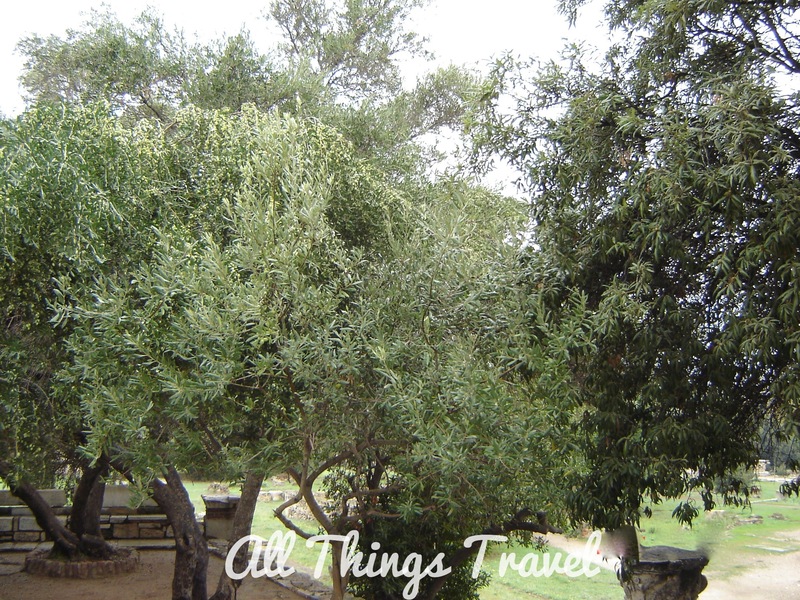 According to Greek mythology, the goddess, Athena, gave the olive tree to the Greeks. In a competition with Athena for the position of patron god of the city, Poseidon, God of the Sea, threw his trident creating a river where it struck the earth, but the water was too salty to be useable. Athena gave the people the olive tree which provided the people with olives, olive oil, and wood. The people chose Athena as their patron and named their city Athens. Today, Greece is one of the leading producers of olives. A young Greek told me that since their entry into the European Union, many Greek olives are shipped to Italy where they are labeled as Italian products for export. I don’t know whether or not that’s a “new Greek myth” but it was an interesting story. If you’re a cheese lover, you can’t help but associate feta cheese with Greece. Apparently, there is controversy within the European Union over this product, too. The Greeks prevailed on the issue and obtained a PDO (Protected Designation of Origin) from the EU which essentially requires that cheese produced in the EU outside of Greece cannot be called feta. If you’re interested, you can read more about “The Feta Cheese Dispute” here (Peluso, 2005). The restriction does not apply outside the EU, however, so if you’re buying feta cheese in the US, look for a product made in Greece. If it’s produced in the US, it’s likely made from cow’s milk rather than sheep’s milk and not nearly as tasty. With olives and feta we’re well on our way to a Greek salad and lots of other Greek dishes, too. What I especially love about a Greek salad in Greece is that there’s no lettuce, just tomatoes, cucumbers, onions, olives, feta, olive oil, oregano, and sometimes green peppers. Yum! On the other hand, I was never a fan of lamb. When I was a child and we had it at Easter, I think it was the mint jelly that I especially disliked. As an adult, I prepared lamb one year for Easter and even the dog wouldn’t come into the house. As you can imagine, I was hesitant to try it in Greece but I did and I’m happy to report I loved it. 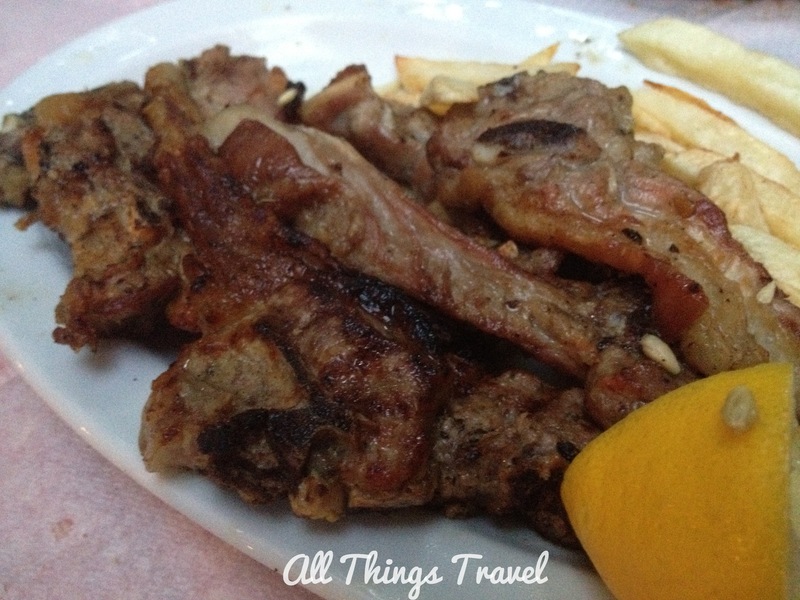 We found several restaurants in Athens where we particularly enjoyed lamb as well as other Greek dishes. 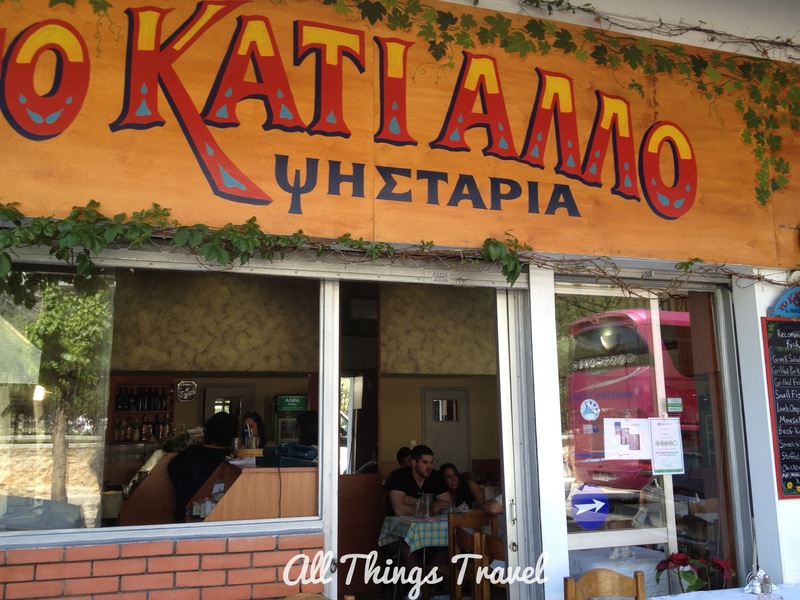 Our favorite restaurant, Taverna Karavitis, sold lamb by the kilo and when you’re traveling with my family, that’s definitely the way to go. We sat in the garden on a warm evening and enjoyed the house wine with our Greek salad, bread, tzatziki (cucumber yogurt dip), tirokafteri (spicy cheese dip), Keftedes (fried meatballs), and grilled lamb. As my son commented, it was an epic experience. 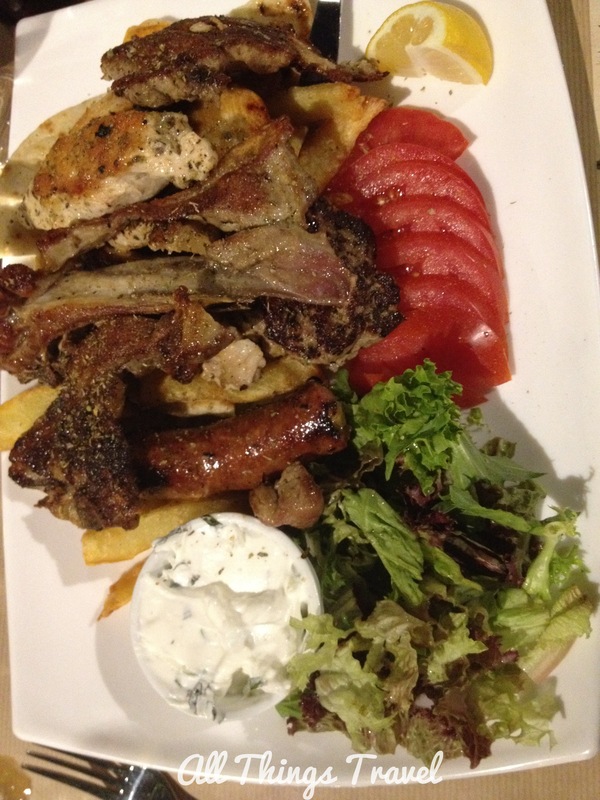 Another favorite restaurant is located directly behind the new Acropolis Museum. 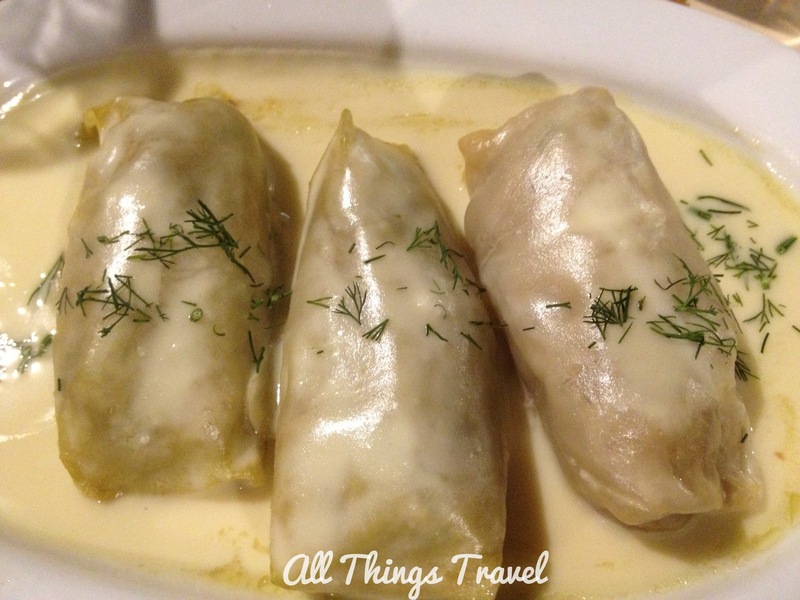 To Kati Allo is a small family run operation with food prepared right before your eyes. 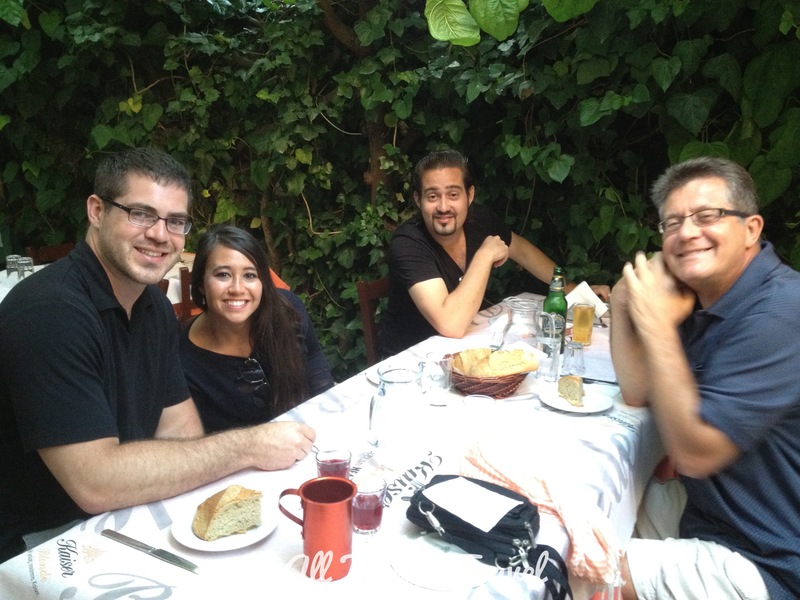 We struck up a conversation with our waitress and learned she’s an American who met the son of the owners while studying in Athens, married him, and is still there raising a family and working in the restaurant. Along the pedestrian walkway of Makrygianni Street, you’ll find many restaurants that cater to the constant foot traffic of tourists to and from the Acropolis metro station. The outdoor seating is especially pleasant on warm evenings. We had some very tasty dishes at God’s Restaurant, which is recommended by Rick Steves, according to their sign. 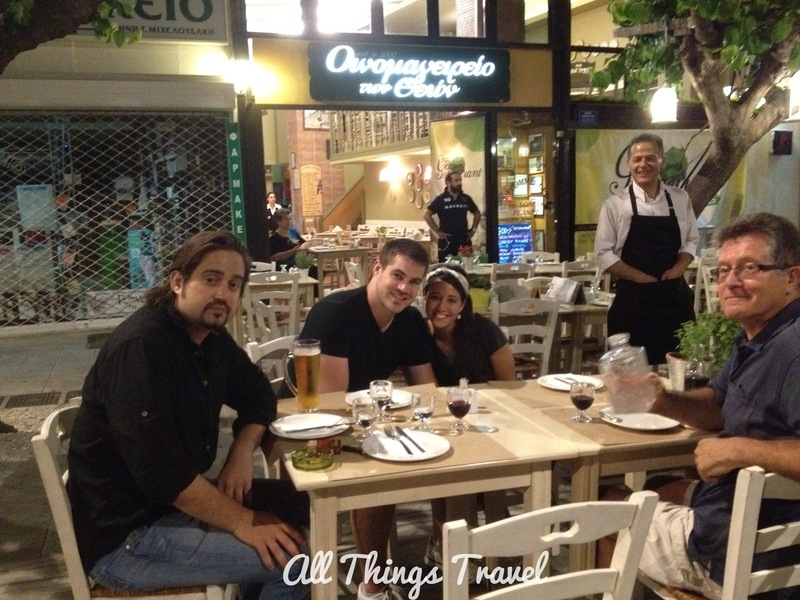 There are many other good basic restaurants as well as fine dining establishments in Athens. Strofi Restaurant was close to our hotel with a terrific view of the Acropolis from the rooftop dining area. We had an excellent meal but I somehow neglected to get photos. 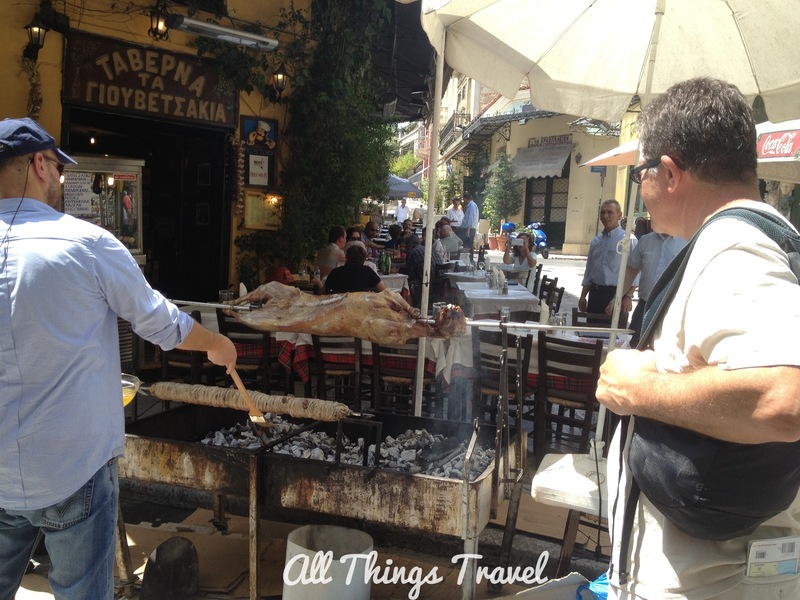 In the Plaka, a charming old neighborhood at the foot of the Acropolis, you’ll find lots of eateries but keep in mind you’re paying for location here in addition to the quality of the food. If you want take-out, opportunities abound. 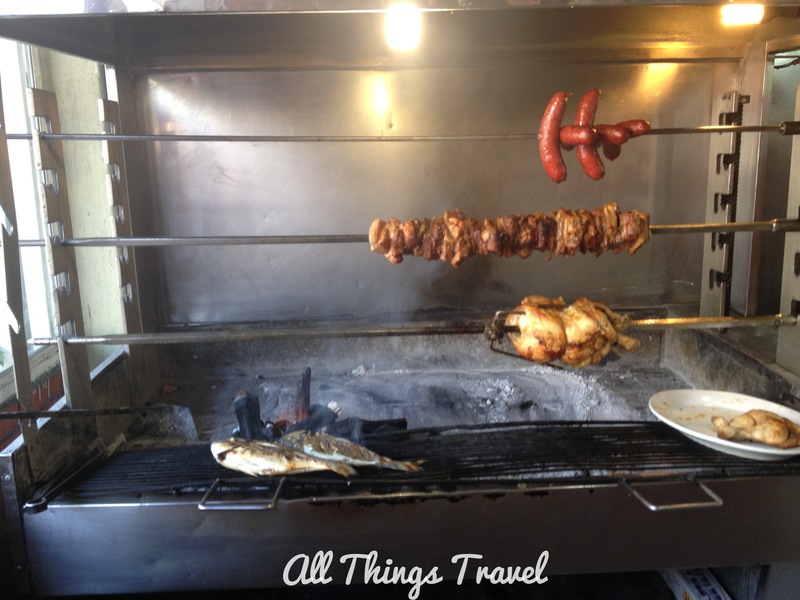 Be sure to stop somewhere for souvlaki, grilled chunks of meat on a stick, the Greek version of fast food. 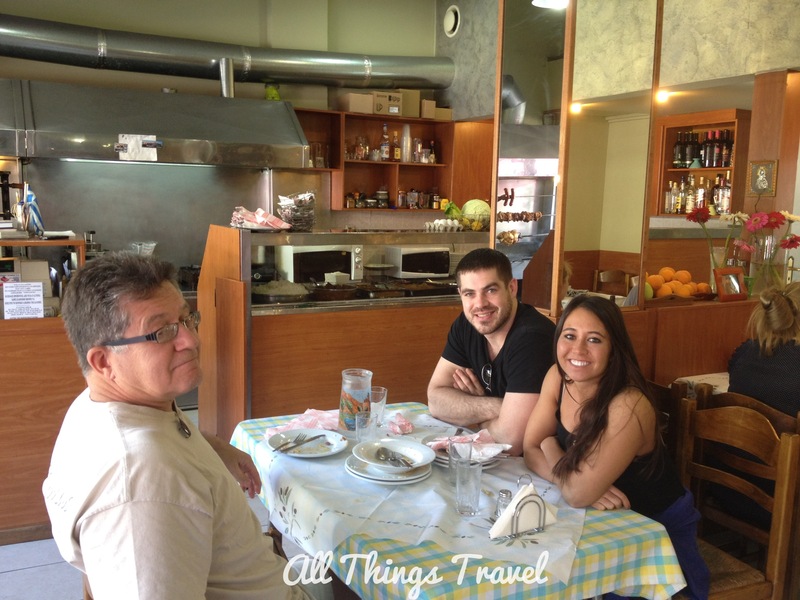 (I’ll cover our favorite place for souvlaki in a later post about Santorini.) Whether you prefer to wander and pick a place that appeals to you or do your research ahead of time, you’ll find plenty of delicious Greek food in Athens. Opa! I am so hungry after reading this post!! Very interesting about the Feta Cheese Dispute!!! I am not a feta cheese lover at all—in fact I really do not like it and have to pick out any crumbs of it if there are any that land in my salad. I think it is one of those things that you either love or hate. 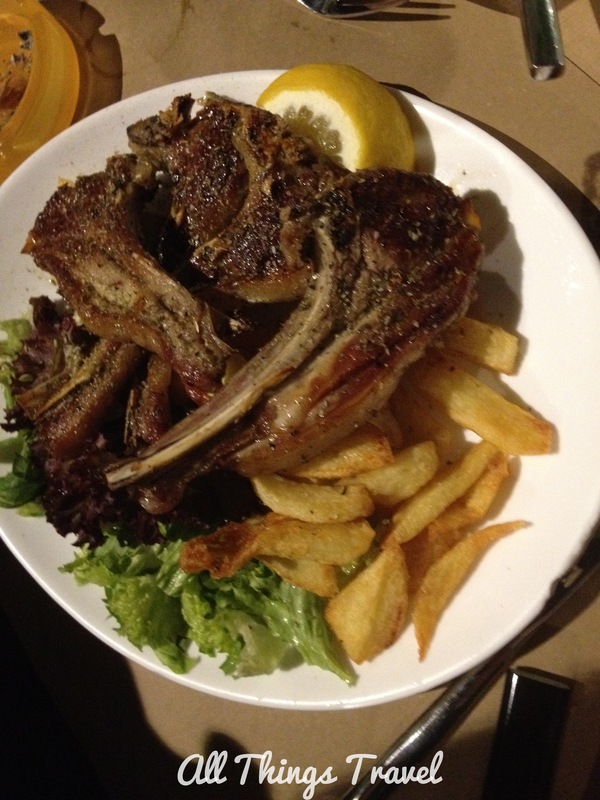 Lamb has always been a real favorite of mine especially after having some really good dishes in Australia. I have never attempted to cook it on my own and maybe it is better left that way, right? I do love Greek food without the feta—but then it really is not greek, right? The pictures of the family enjoying all the lovely offerings made me smile. Looks like some great memories were made. Thanks, Beth Ann. Our kids grew up traveling with us and we still enjoy taking them along. It’s harder to get us all together these days so that much sweeter when we can. I totally get that!!! It makes it wonderful to be together as a family enjoying experiences like this!!! Beautiful post, pictures are delicious and very tempting…I must say the blog “All Things Travel”…Life is short and travel like you mean it…wonderful title and tagline is superb!!! Thank you for your kind words. Greece has so much more to offer than I could ever hope to capture. Yes, a place looking forward to visit, already in my travel calender…heard a lot about it. My dinner won’t be ready for an hour and this post is making me terribly hungry! I hope your dinner is as good as our meals were. Thanks for checking out my post.